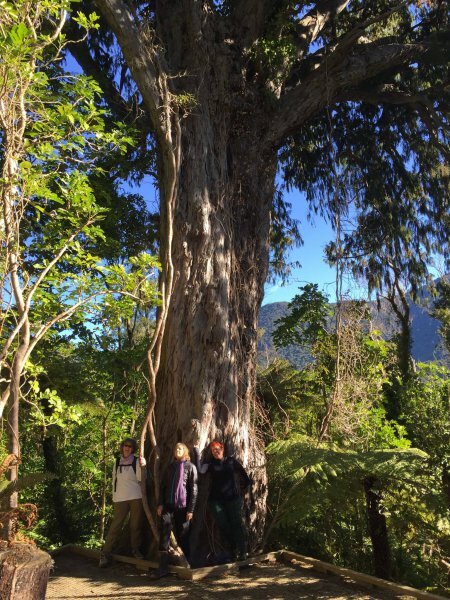 Howden’s Bush was bequeathed to the Crown about 40 years ago by Captain Howden, son of the first owner of Furneaux, a large family property in the North-east corner of Endeavour Inlet. The original house is now known as Furneaux Lodge. Howden’s Bush is the only remnant of original and unlogged coastal forest in Queen Charlotte Sound (even Ship Cove was partly logged). Howden’s Bush is listed within the Marlborough Sounds Resource Management Plan as of national significance in terms of its ecological value, being an area of podocarp/broadleaved forest. It is considered by the Department of Conservation as “high (biodiversity/ecological) value conservation estate”. Approximately 50 metres from the Queen Charlotte Track, and just beyond the back boundary of one of these sections, is the rimu. This Ancient tree is probably not noticeably different in appearance from when Cook first visited this bay in 1772. Even then, the canopy would have been so striking that it would have been noticed by Cook and his crew, who released the first pigs just a few hundred yards away, after coming in the ship’s cutter into the bay. It would have been here, possibly already a handsome tree, when the Magna Carta was signed, and quite probably was growing when William the Conqueror sailed to England in 1066. The tree would have had huia in its branches, and kakapo living under its roots, in its time. Burstall and Sale (Great Trees of New Zealand, 1984) name a rimu at Granity as possibly the biggest in the South Island (DBH: 1.99m, Ht: 36m, Sp: 26m) – the Howden’s Bush rimu certainly rivals this. Under the tree there is a large debris mound, derived from decaying bark and vegetation accumulated over the ages and which is essential to survival of the tree. It is not unsurprising that all who walk up to the tree wish to walk up the mound to touch its trunk, but in doing so endanger the tree’s long-term survival. Due to increasing visitation numbers in recent years and concerns over the impact this activity is having on the tree, a board walk and viewing platform has been installed to protect it. Visitors are strongly advised and encouraged to remain on the main track to avoid damaging the fragile root zone so that this tree remains with us for many years to come (Judy Helstrom, 2015). 27 Jul 2015 Hellstrom, J.